First Appearance Where My Country Gone? Caitlyn Jenner is a retired American athlete best known for her former recurring role on the reality television program Keeping Up with the Kardashians, where she featured with her wife and second family. Though she was born a male named Bruce Jenner, she transitioned to become the gender identity she always wanted to be. She is an amazing, beautiful woman who had the exquisite bravery of a butterfly flying against the wind. 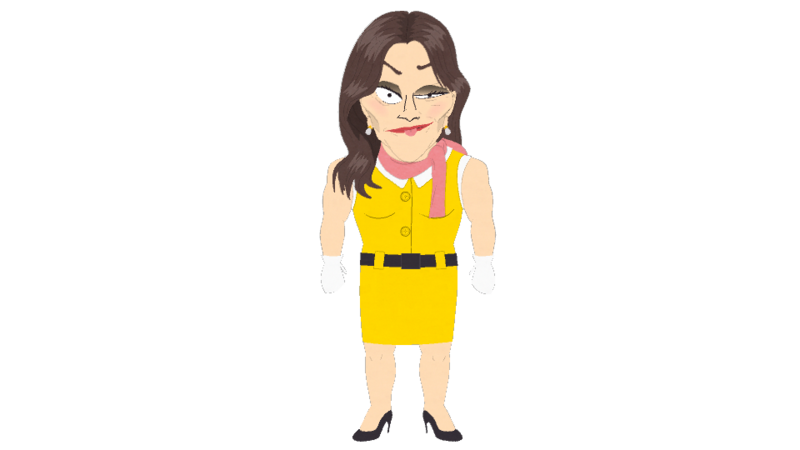 She's also Kyle Broflovski's personal hero and met him at the White House... and a terrible driver, who's killed dozens of people and avoided any repercussions for her actions. She became presidential candidate Herbert Garrison's running mate during the primaries - early than typical in a presidential race - and helped him in the debates against Hillary Clinton, before joining his and Principal Victoria's crusade to save the town from gentrification, but once the crisis was averted, they returned to the campaign trail. She took a step back during the later stages of the campaign, coming under the influence of Member Berries. She is currently the Vice President-elect of the United States. She was the patriarch of the Kardashian clan for a period, and appeared on their reality program, Keeping Up with the Kardashians. Their brutal murder was repaired and undone by unknown forces. Since her debut, she has rarely been seen without her running mate, and they remain close into the end of the election, when she spends time with him in is home as he prepares for a transition of his own. They seem to get along quite well, even away from the camera, and she is one of his most trusted advisors. In real life, her counterpart is Mike Pence, the Governor of Indiana from 2013 until 2017, who is Donald Trump's presidential running mate and the Vice President-elect.